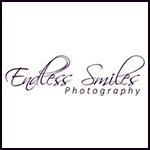 Welcome to Endless Smiles Photography!! I specialize in portrait photography of all ages, as well as commercial photography for all your business needs. Of course, we can’t forget our four legged friends too! I am here to capture the first few moments of your newborn, first cake smash and future milestones. I will make your portrait session fun and enjoyable with flawless pictures. Please browse my website and contact me with any questions. Looking forward to creating and capturing those special memories long after those pictures have been taken.